There are a lot of informal end-to-end processes in organizations. These end-to-end processes are usually supported by scattered applications, email, spreadsheets and a lot of goodwill of the personnel involved. When compliance, regulations and/or customer demands are imposed on an organization, these end-to-end processes do not have the ability to comply with new demands due to lack of support from the current application landscape. In the financial, public and utilities market organizations are re-landscaping their existing application portfolio due to these higher compliance, regulations and customer demands. This often is not a huge transformation program, with a roadmap spanning over years. Case management can help cross the bridge from the current landscape towards a landscape aimed at delivering these higher demands. Let’s explain this with the process of complaints. This functionality is needed in any market where customer contact is present, and where due to increasing compliance and customer demands the bar needs to be raised to deliver better quality, such as delivering an answer within a given timeframe. The customer is not satisfied and sends a complaint or calls the organization. The Complaint process is separated in two main parts, the task handling and the case handling. Task handling covers the receive- and register process of the complaint. If a complaint can be handled directly without internal process, the complaint process can be done by using a task. If a complaint cannot be handled directly because for instance another person must be involved in the process the complaint will be continued by a case. The complaints end-to-end process is milestone driven. The path towards reaching a milestone includes different tasks. Especially the Assessment phase can include multiple tasks across departments, going back and forth. Time-out checks and customer intervention can directly interfere with the complaint handling. Oracle Case management delivers functionality to manage the three key stages of the process, control, automate and improve. At first the current processes are overarched by a case management wrapper in which the high level milestones determine the steps that need to be taken, and which can be controlled on timing an delivery. Every main step is designed in Oracle Case Management as a milestone, each milestone can be revoked for example when the customer, after informing him, disagrees with the outcome, and which further investigation needs to be done. The simplest way to start is attaching Human tasks to the milestones, which acts as a checklist for ensuring that all the activities are done. The complaints specialists and other actors involved keep on doing the work in the same way, additionally they need to update checklists when a certain activity is done. This maintains and audit trail tracking the progress of all complaints processes and ensuring SLA’s are managed, no delayed delivery of answers to the customer and at the same timing enforcing compliance rules and regulations. The Control phase delivers knowledge which areas are best suitable for automation. in the next phase Automate the move can be made from 90% manual up to 90% automated, freeing up time for the complaint specialists to spend their time on more value added activities. An essential step in completing this phase is that the Case management structure within Oracle Case Management acts as the constant controlling elements, the processes underneath can change, the rules for finishing milestones can change, events can change and even the milestones can change, but Case control stays in place. The optimize phase does not have to wait until the automate phase is completed. Already during the control phase dashboard can be utilized identifying bottlenecks and delays in the process, enabling for root cause analysis and eventually supporting process improvement This can be done via the out-of-the-box functionality within Oracle BPM, showing the activity logging and with the addition of Key Performance Driven measurements with Business Activity Monitoring (BAM). Want to know how we control the process to make the steps towards automation and optimization? Oracle makes a habit of adding important functionality to minor patch sets. 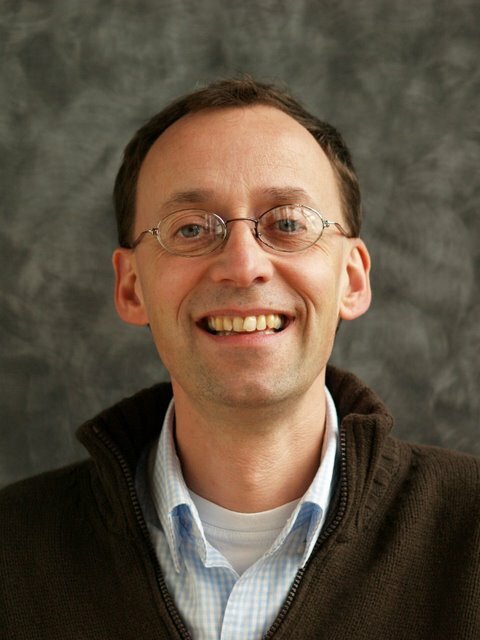 In the recent 11G Release 2 Patch set 6 of Fusion middleware, Oracle has added a milestone in the BPM stack, the Case management functionality. Discussions around this topic had already been going for a while, but finally the first part of it is included in the Fusion Middleware stack. In this blog I will elaborate its importance and what is contains Since this an important functional addition we will publish more detailed blogs around this topic in the near future. What functionality is needed for Case Management? Organizations increasingly need to deal with unstructured processes that Business Process Management Suites are not designed to cope with. Case Management is a way to govern and control these unstructured processes, but Case Management solutions can be challenging to develop. Developing Case Management around a BPM solution preferably in conjunction with an Enterprise Content Management System solves many of these problems. A case is a collection of activities that support a specific business objective. Each case has a lifecycle. During that lifecycle there will be a range of activities and requirements; information and content may need to be gathered in a wide range of formats (such as documents, email, minutes, interviews, photos and other data). Throughout there will be process related tasks and actions, human decisions and interventions. At any time in the lifecycle we should be able to have a holistic view of the case, create reports and review audit trails. A case will be subject to organizational policy or procedure, which determines the appropriate outcomes. Portals and Dashboards – Portals bring together all information around the case, lifecycle related activities, finished work, involved persons, gathering media into a 360 degree view. Dashboards give insight in SLAs and KPIs related to the case. Processes and Rules Management – BPM and rules management play an important role in the execution of all tasks by participants and related applications. Flexibility can be added to the solution with rules management. Integration – A core component in the solution enabling integration of case management with the application landscape, including connections with an Enterprise Content Management system. Re-use of components across the Oracle 11G Fusion Middleware stack, for instance a Database Adapter, is essential. It improves stability and predictability of the solution. BPM just is one of the components plugging into the stack and reuses all other components. The result of this principle is that adding Case Management to the Fusion Middleware is ‘only’ a matter of adding core Case Management capabilities, such as lifecycle management, the ability to combine together processes and activate case functionalities based upon events. In the current version all design and run-time case management functionality is included except the portal component, this will likely to be part of release 12c. 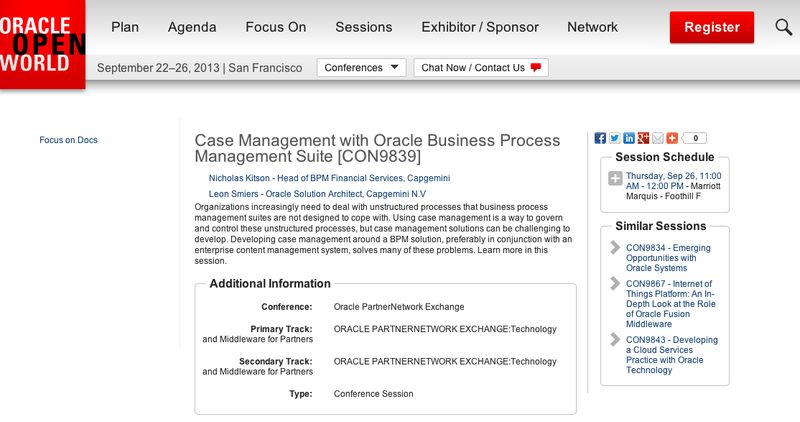 After creation of a Case Management in Oracle BPM the two main components of the implementation appear, a Case object and a Case related rules set. The case object gives the ability to define the case definition on a high level. 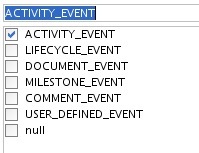 Milestones, Data and Documents, User Events, Permissions to name the most important. Here an example of data objects as defined in an example case provided by Oracle (the car loan example). The Case Rule engine is the work-horse of the Case management implementation, which is based upon the well-known Oracle Business Rules engine. 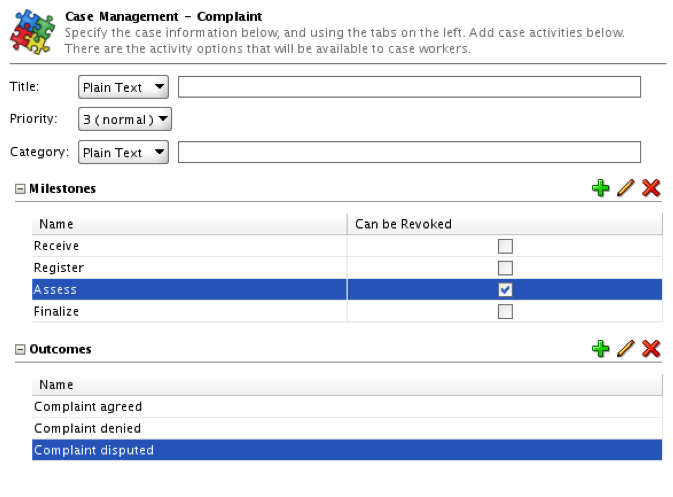 In this Rules engine a predefined set of Case Management data objects can be used to steer anything going on in the case. This rules engine enables a complete event driven case management solution. 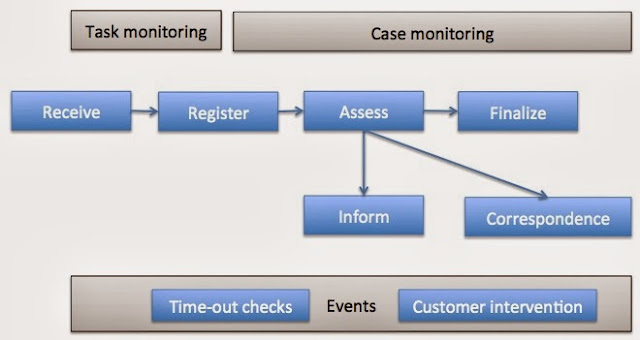 Examples of the Case Management rules engine when an event occurs; a sequence of actions; Closing of Milestones (reach milestone); Withdrawing of activities. An (asynchronous) process can easily be connected to a case. 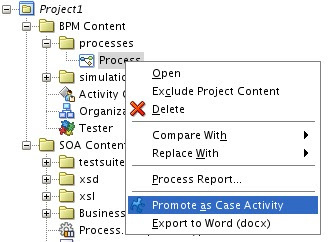 After creation, the process can be promoted to a Case Activity. This will make the process part of the Case lifecycle and enables it to be used in the Rules engine. It takes some time to understand the true power of Case Management as part of Oracle BPM. There is maximum reuse of existing BPM assets. The shared data & documents environment enables easy sharing of information across case activities, and the complete event based rules approach enables complete lifecycle management in a simplified way. This all enables fast delivery of a case management solution. Improvement points however are the current lack of a portal component and a more business oriented design environment, since Business rules is rather techie aimed.